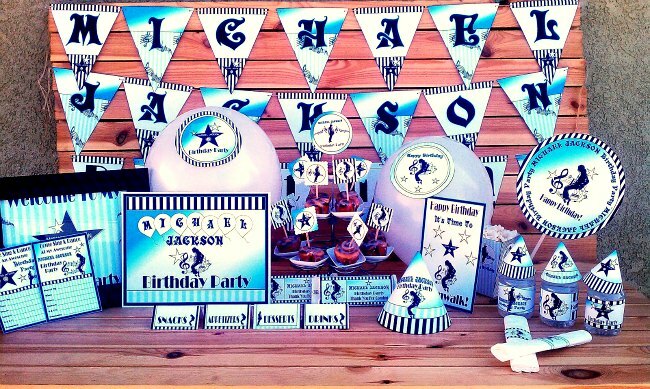 If you love M.J. this is a great theme for you to infuse your love for the King of pop into your next birthday party. 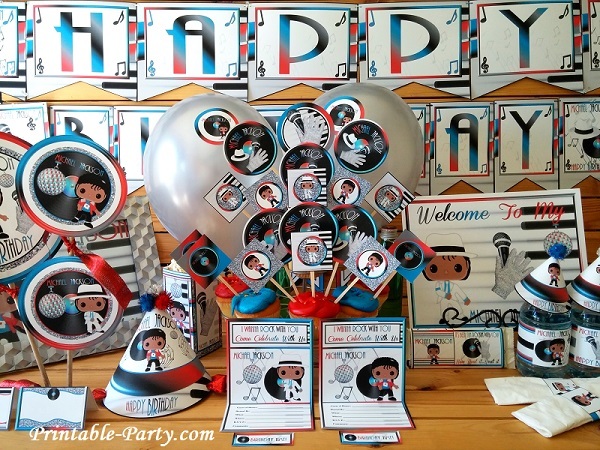 Printable Michael Jackson party supplies that you print at home, office, local copy shop, & office supply store. Uniquely designed using aqua blue & black stripes with blended ocean blue color throughout. 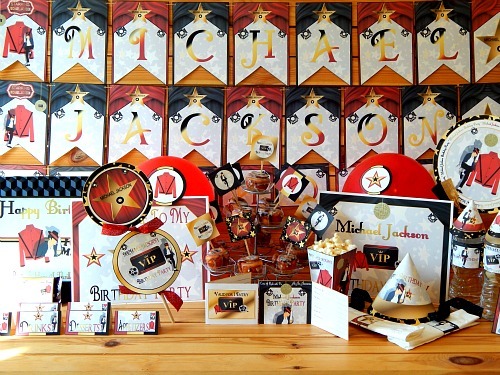 This theme has images of music notes, black Hollywood walk of fame stars, white stars, & the King of Pop. Wow! 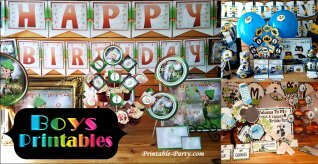 your party guests with your cool decorating style & unique printable party ware that they've never seen before. 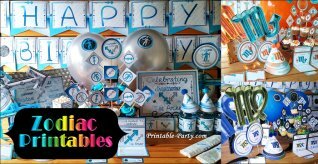 This party decorating kit is a multiple page PDF that allows you to print as many pages as you need to style your party. 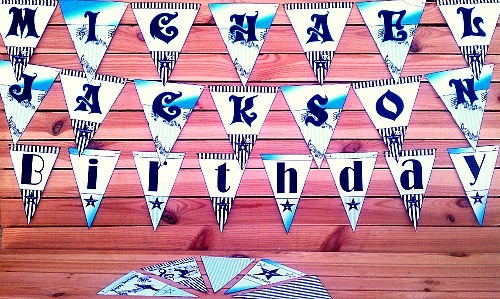 Just print, trim, & assemble to decorate. All Downloadable Orders Available To You Instantly Via File Link. 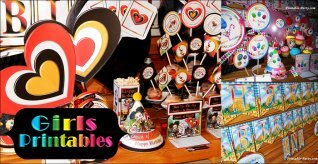 Orders Are Also Sent To Your Email Address Instantly After Purchases. See How Ordering Works. 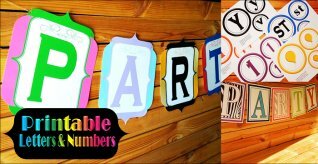 Printable pages print out clear & are easy to trim out and assemble using the full instructions that are included. 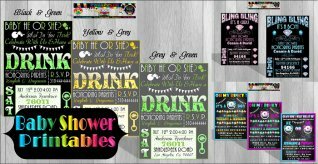 After ordering you must open your files in the newest version of the Free Adobe PDF Reader If you'd like to view, print, or add your own digital text onto invites and other printables in the pack. 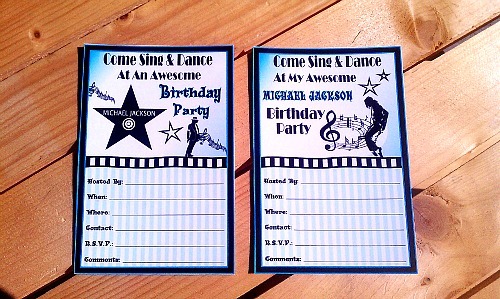 Looks great when printed on really thick card stock paper. We use 110 lb paper when we print orders. 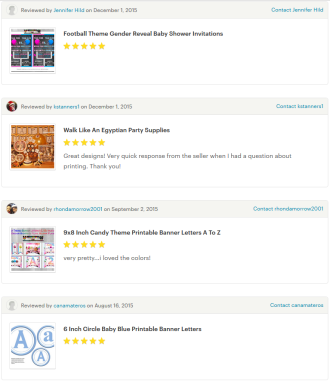 To know more about how you can add digital text onto the printables View Our FAQ List or Contact Us. 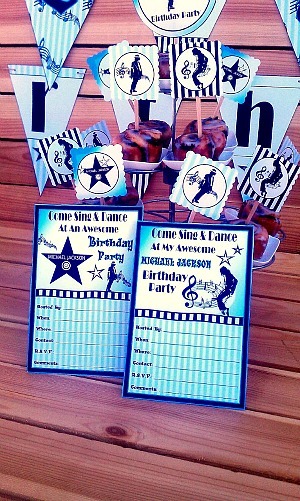 Birthday party invites are blasted with ocean blue color. Black & aqua stripes are embedded within. 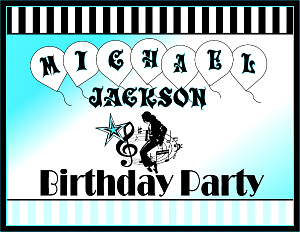 You'll find stars, music notes & MJ dancing. 5x3 inch snack box can be filled with chips, popcorn, cookies, or any other dry snacks. 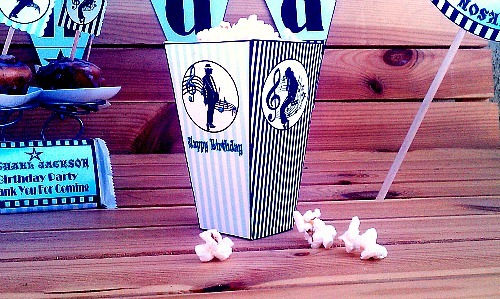 Box can also be used for favors. 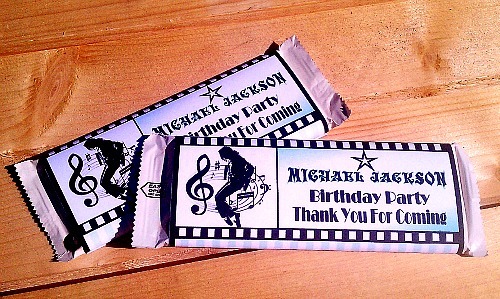 These MJ drink wrappers come in 3 designs as shown. All labels wrap around any bottled drink made for personal use. 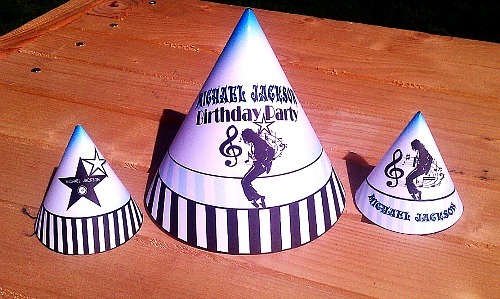 Standard size cone party hat in 1 design. 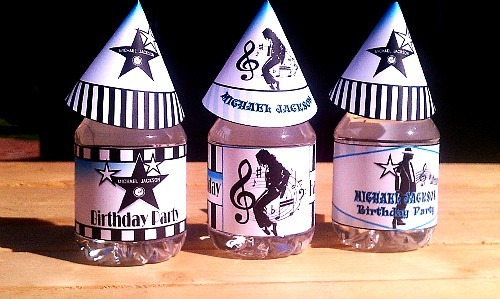 You also get mini bottle topper hat for bottle decoration or table decoration. Mini hats come in 2 designs. Candy labels fit around 1.55 ounce Hershey chocolate candy bar. Comes in 1 design & can easily be trimmed out & seal using a glue stick.